As we’re zeroing in on October 1st, the International Day of Older Persons, it’s high time we turn the spotlight to our expeditiously ageing world. While healthcare professionals are tasked with overcoming staff shortages and budget cuts, new startup companies have turned their attention to elderly care robotics to counter social vulnerability. Among them, Intuition Robotics are currently testing Elli.Q, a proactive ageing companion specifically aimed for private use. Globally, the age group of 60 and over is surpassing any younger age group in growth. (“Ageing”) Based on data from the World Population Prospects, around 962 million people belong to this group as of 2017, comprising a whopping 13% of the global population. Moreover, this statistic is only expected to rise to 22% of the global population by 2050, accounting for 2,1 billion people aged 60 or older. (“World Population Prospects” 11-13) Nevertheless, even in higher-income countries, healthcare systems are unable to keep up, leading to a global “epidemic” (Sutherland 19) in elderly care. (“Global Elderly Care in Crisis”) In the U.K., public funding for the social care of the elderly underwent a dramatic decrease of £1,2 between the years 2011 and 2014 alone. In another corner of the world 32% of Chinese aged over 60 suffer from poor health, 38% struggle with daily tasks, 40% presented symptoms of depression. (“Global Elderly Care in Crisis”) In real terms, these numbers create a climate of social vulnerability. (Khaksar et al 438-439) Social vulnerability “limits daily life and decision-making in a wider group of older people who are likely to have a loss of mental and physical functions” (438) This vulnerability fosters a need for innovation. Meet ElliQ, the social robot aimed at “keeping older adults active & engaged.” (“ELLI Q”) Founded in 2016 Israel, Intuition Robotics is putting artificial intelligence and intuitive interaction models to the test in order to provide clients with an “aging companion” (“ELLI Q”) that will help them reap the benefits of modern technology in order to stay healthy and connected with their loved ones. 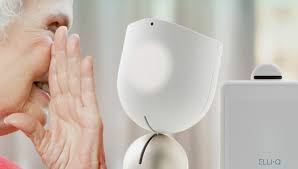 Simultaneously, research on assistive robotic technology warns about the potential of elderly robotics to reduce human contact through the limited need for social interactions with external agents for daily requirements. (Sharkey 29) (Vercelli, 37-40) Additionally, the European Civil Law Rules in Robotics expresses the same concern and establishes that the robot “may not substitute humans entirely,” (“The European Civil Law Rules in Robotics” 24) suggesting even to place a time-limit for interactions with the robot. The CEO of the company, Dor Skuler, emphasizes in an interview with the Future Tech podcast that the company has explicitly avoided a “humanoid design” and has instead implemented a “robotic voice” (“Dor Skuler – CEO – Intuition Robotics”) for Elli.Q. In a different interview he adds, “I don’t think we want to live in a world where AIs pretend to be human” (Simon) Yet, in a segment of the interview where he details the experiences of Beta-testers, Skuler delights in the fact that subjects unanimously refer to Elli.Q as a “she.” (“Dor Skuler – CEO – Intuition Robotics”) He is more hesitant to admit that some of the subjects missed Elli.Q when she was taken away from their homes for maintenance. On that same note, the official website of the product playfully encourages you to “Stay friends with Elli.Q” (“ELLI Q”) and eagerly presents you with quotes from Beta-testers, who developed emotional bonds with the product. Dor Skuler laments that Elli.Q “can do first order of context relatively well” but is “not really intelligent yet.” (“Dor Skuler – CEO – Intuition Robotics) There is an intention to move toward an ‘intelligent design’ expressed alongside concerns about the misnomation of artificial intelligence as a replacement for a human companion in Skuler’s interview. This cognitive dissonance permeating the interview can be viewed as a representation of the cloudy territory in which the public awaits the launch of Elli.Q into the open market. Will Elli.Q be on your wishlist? Bemelmans, Roger, et al. “Socially Assistive Robots in Elderly Care: A Systematic Review into Effects and Effectiveness.” Journal of the American Medical Directors Association, vol. 13, no. 2, 2012, doi:10.1016/j.jamda.2010.10.002. Bercovici, Jeff. “This Company’s ‘Social Robot’ Will Read Trump’s Tweets Aloud to Your Grandma.” Inc.com, Inc., 26 Apr. 2018, www.inc.com/magazine/201805/jeff-bercovici/elliq-robot-elderly-care.html. Bharadwaj, Raghav. “Applications of Artificial Intelligence in Elderly Care Robotics.” TechEmergence, 12 Mar. 2018, www.techemergence.com/applications-of-ai-in-elderly-care-robotics/.“Dor Skuler – CEO – Intuition Robotics.” Future Tech Podcast, www.futuretechpodcast.com/podcasts/dor-skuler-ceo-intuition-robotics/. “ELLI Q.” Intuition Robotics, elliq.com/. Frangoul, Anmar. “Artificial Intelligence Is Helping to Transform the Way Elderly People Are Cared for .” CNBC, CNBC, 3 May 2018, www.cnbc.com/2018/05/03/ai-helping-to-transforming-elderly-health-care.html. Greulich-Smith, Tamsin. “Can Artificial Intelligence Care for the Elderly?” GovInsider, 2 May 2018, govinsider.asia/innovation/artificial-intelligence-ageing-population/. Ifr. “World Robotics Survey:” IFR International Federation of Robotics, ifr.org/news/world-robotics-survey-service-robots-are-conquering-the-world-/. Khaksar, Seyed Mohammad Sadegh, et al. “Service Innovation Using Social Robot to Reduce Social Vulnerability among Older People in Residential Care Facilities.” Technological Forecasting and Social Change, vol. 113, 2016, pp. 438–453., doi:10.1016/j.techfore.2016.07.009. “Global Elderly Care in Crisis.” The Lancet, vol. 383, no. 9921, 2014, p. 927., doi:10.1016/s0140-6736(14)60463-3. “Your Grandparents Will Love Being Friends with This Robot.” Mashable, Mashable, 17 Jan. 2018, mashable.com/2018/01/17/elliq/?europe=true#WtT4.KymPkqy. Rieland, Randy. “Alexa? How Voice-First Technology Helps Older Adults.” Next Avenue, 4 June 2018, www.nextavenue.org/alexa-voice-first-technology-older-adults/. Sawers, Paul. “Intuition Robotics Nabs Samsung as Investor, Launches U.S. Beta Trial of ElliQ Companion Robot.” VentureBeat, VentureBeat, 18 Jan. 2018, venturebeat.com/2018/01/09/intuition-robotics-nabs-samsung-as-investor-and-launches-beta-trial-of-elliq-social-companion-robot/. Simon, Matt. “We Need to Talk About Robots Trying to Pass as Humans.” Wired, Conde Nast, 6 June 2018, www.wired.com/story/we-need-to-talk-about-robots-trying-to-pass-as-humans/. “These Were the 6 Most Popular Trends I Saw at the Biggest Technology Show of 2018.” Business Insider, 16 Jan. 2018, www.businessinsider.nl/ces-2018-most-popular-tech-trends-2018-1/?international=true&r=US#3-robots-that-can-keep-you-company-3. Sutherland, John. “A new war on the Old: our generational crisis requires honesty.” New Statesman, 20 Jan. 2017, p. 19. Literature Resource Center, http://link.galegroup.com.proxy.uba.uva.nl:2048/apps/doc/A480594141/LitRC?u=amst&sid=LitRC&xid=89856e65. Accessed 23 Sept. 2018. “World Population Prospects: The 2017 Revision, Key findings and Advance tables”. United Nations Department of Economic and Social Affairs/Population Division, United Nations, 2017, New York (1-46). “Dor Skuler – CEO – Intuition Robotics.” Future Tech Podcast, www.futuretechpodcast.com/podcasts/dor-skuler-ceo-intuition-robotics/. New ROBOTICS: The Genesis of Artificial Creativity?